HTML and CSS are not foreign words for me but I regret, I’m not a Web designer - I see myself as a webdeveloper. But at least a dressy side is a must. But thank good there are some ready “Systems”. 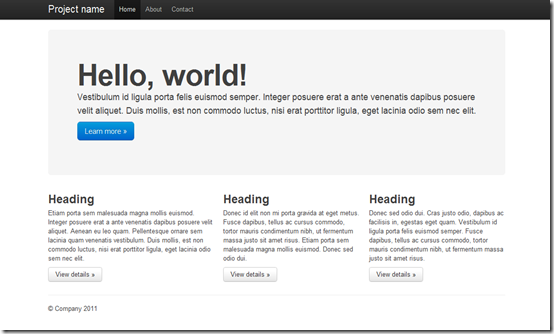 Twitter Bootstrap is a Toolkit for every kind of Web applications. It includes some basic styles and also some special styles for Buttons, charts, forms and so on. After all it is a smart Grid-System. Compared to other CSS Grid Frameworks Twitter Bootstrap seems to be more “round” and it offers some basic elements. The best way is to take a look online. You will find a source on GitHub. Twitter Bootstrap seems to be a great entrance for non-designer with many nice elements. The only think I’ve missed is a version for Mobile websites – I’m looking forward to it. Download and everything else on GitHub.